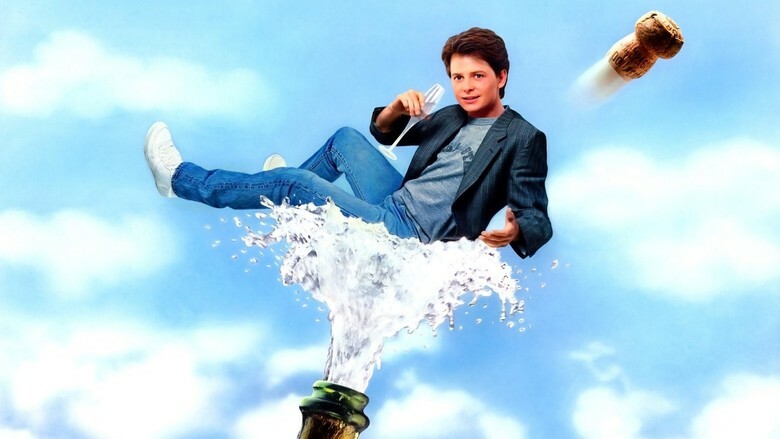 As my best friend will attest, I subjected everyone at my birthday parties of yore to Michael J. Fox’s fragrant slice of 80’s cheese "The Secret Of My Success." The first time I encountered it, however, was one Saturday night with my family in the basement of our home on 220 3rd St. The next Sunday morning we were at church and after the service we stood around with several other families for coffee and snacks – because this was a Lutheran church and that’s what you do – by the window because it was thundering and lightning and pouring rain. I remember this moment vividly, and I remember it vividly because I remember thinking 1.) My soccer game scheduled for this afternoon is totally going to be rained out. 2.) This means I can go home and watch “The Secret Of My Success” again! Which I did. In retrospect, this moment signified something humongous. I was cold chillin’ in the Lord’s House, eating my donuts, but I wasn’t thinking about the sermon or the liturgy or Sunday School class (which, truth be told, I could not STAND until my two best friends joined our church several years later). No, I was thinking about the montage in "The Secret Of My Success" set to "Oh Yeah" (“day bow bow”) by Yello. I wanted NOTHING to do with strapping on my shin guards and chasing around a soccer ball. Ugh. I wanted to watch Michael J. Fox Walking on Sunshine as he delivered corporate mail. Church is nice. Organized sports are just fine. But movies and music, that’s where it’s at…..for me anyway. I thought of that moment in my life just recently when I read a passage in the late Bill Holm’s wonderful book "Eccentric Islands: Travels Real and Imaginary." He wrote: “I am, whether by DNA or inclination, an Evangelical Literary Fundamentalist. Stories are true. Poems are true. What lasts for a thousand years in the consciousness is true. Music is true.” (He did not, unfortunately, write Movies are true, but he may as well have.) At that instant I - to quote Samuel L. Jackson in "Pulp Fiction" - "experienced what alcoholics refer to as a moment of clarity." I read a couple more paragraphs and then realized they did not take. I tried a second time. No luck. I was so struck by that passage it overwhelmed me and, thus, I spent the rest of my lunch staring out the window (ah?) and pondering what it meant and what it meant to me. Twenty years ago today a film set during the French & Indian War called "Last of the Mohicans" hit theaters. I was but a wee (read: dorky) high school freshman still stricken with a rap music infatuation and, thus, had far more interest in the EPMD Business Never Personal cassette tape (you heard me) I received as a birthday present several weeks earlier (“strictly underground funk, keep the Crossover”) than with a romantic adventure set 200 years in the past. I was roughly a year away from checking out the film on home VHS (you heard me) and having my life take a sharp turn toward the melodramatic moron writing these words. My Mom & Dad, however, did catch the movie at the theater and I recall them giving it positive reviews when they returned home. 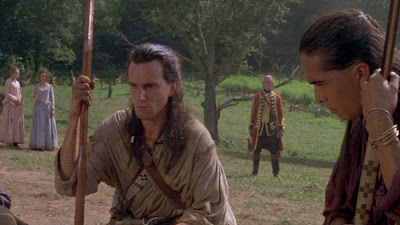 Perhaps because my brain works in mysterious ways I always find the notion of their theatrical viewing of Last of the Mohicans as funny and mystical, because little did they know just what they were watching. I remember my Dad recounting the scene in which the intrepid gang goes over the waterfall in a canoe (my Dad is an avid canoer) and, hey, what might Dad have said if someone from the future suddenly appeared in a plume of smoke at that instant and advised him his idiot son would drive halfway across the country years later to STAND BESIDE THAT VERY SAME WATERFALL? For many years I harbored the misplaced dream of making and/or writing movies. It was not merely misplaced because I have now realized that I both much more enjoy and am much more skilled at writing about movies (those who can't do pontificate in various internet forums) and which makes me desperately wish I could rewind the clock back to the late 90's and enroll in college for journalism instead of enrolling in college without any clear idea of who the hell I was or what the hell I was doing......but don't get me started. 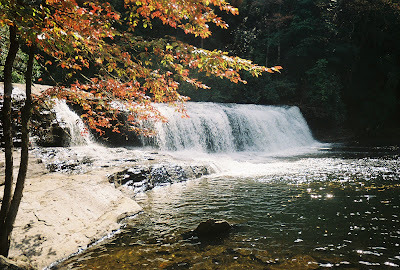 No, it was misplaced because when I reached that waterfall, illuminated by the striking Blue Ridge foliage, I imagined the canoe carrying Hawkeye and Cora and Alice and Uncas and Chingachcook making its way oh so dramatically over them and that's all I imagined. I did not imagine Michael Mann there in a vest and turtleneck (?) gazing through the viewfinder of his camera and then hollering instructions at Dante Spinotti, his cinematographer. I did not imagine Daniel Day Lewis sipping herbal tea in his buckskins, waiting for the shot to be set. I did not imagine a fed-up intern shuttling back and forth to service various requests (demands). Nope. I just saw the canoe going over the falls. Well, of course that was all I saw. I'm an Evangelical Literary Fundamentalist. It's why long ago when I first discovered the cinema I was confused about when all those people in "Star Wars" made time to go to the bathroom. Movies.Are.True. Luke blew up the Death Star. Ted Striker landed the plane. Indy discovered the Ark of the Covenant. Peter Blood became Governor of Jamaica. Count Rugen had six fingers. Brantley Foster was Carlton Whitfield. Maverick put on the brakes and Jester flew right by. Ferris, Sloane and Cameron really did in one afternoon what it would actually take a whole two days to accomplish. Robert Gould Shaw really did command the 54th Massachusetts, sure, but he also really did have a runaway slave named Trip in that same outfit. Even then I think I knew all of that was true in some sort of ineffable way even if I didn't know it. But eventually I knew it. "Last of the Mohicans" was my Come to Jesus moment. Awesome post!! The Secret of My Success rules! Man that movie was so much fun, I rewatched some clips of it for my music break a few weeks ago. WOW, you actually went to the Mohicans waterfall??? Way cool!! Hey, what's wrong with you imagining the canoe carrying Hawkeye and co whilst you're there?? I probably won't imagine Michael Mann either, ahah. Movies. Are. True. Very well spoken my friend.